Pioneers in the industry, we offer vegetable fruit rack, fruits vegetable rack, bakery racks and vegetable racks with bins from India. Our clients can avail from us Fruits and Vegetable Racks.These are fabricated using mild steel with powder coatings and possess plastic crates. These are also customized in order to meet the specific requirements of our clients. Moreover, we make these racks available to our clients at competitive prices. Our almost 2 decades of proficiency in this domain has assisted us to provide a wide range of Vegetable and Fruit Rack With Bin. The offered rack is well-suited to use in hotels, malls, factories and other allied places to display vegetable adn fruit in an arranged manner. This rack is manufactured with utmost perfection by our adroit professionals using optimal quality raw materials and modern techniques in adherence with industry standards. Beside this, the provided rack can be purchased from us in different sizes at competitive prices. In order to fulfill the ever changing demands of our clients, we are offering our clients a wide range of Vegetable Display Racks. Manufactured using quality raw material these vegetable racks are highly appreciated due to their strength, quality and durability. 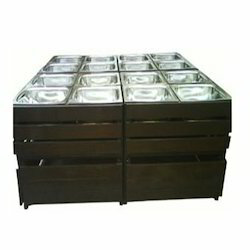 Clients can avail these vegetable racks as per their specifications at market leading prices. 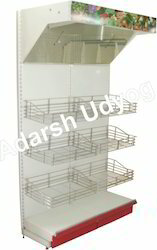 Adarsh Udyog manufacture various style and size of Fruits Vegetable Rack as per the storage capacity required. Available in different sizes, the Fruit Vegetable Racks offered by us are extensively used in supermarkets and hypermarkets. Keeping in mind the varying specification of our clients, we offer our entire range in various shapes and sizes. Cane Basket : 3 nos. 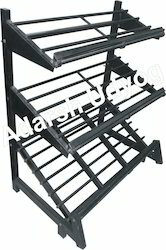 We offer Display Racks for Vegetable for our clients that are widely demanded in malls, shops, houses, etc. for keeping vegetables. The offered racks are ideally suited to place vegetables over their shelving for easy and arranged storage. The provided racks are manufactured at par industry standards by utilizing topnotch quality raw materials and advanced methodology. Available in different dimensions, these racks can be purchased from us at market leading prices. These are specifically designed Vegetable Display Racks in the market. It is designed and developed using approved technology and quality raw material. Looking for Vegetable & Fruit Racks ?